I have a small obsession with mini worlds. Just a small obsession. I love all the mini details, the mini animals, the mini..well everything mini really. I also have a small obsession with dinosaurs. But that’s pretty normal. I mean, most people are obsessed with dinosaurs, right? It can’t be helped. I love sensory play too. It combines everything sensory with everything that I think is awesome about mini worlds. So when I saw this blog post over at Fantastic Fun and Learning, I was stoked. 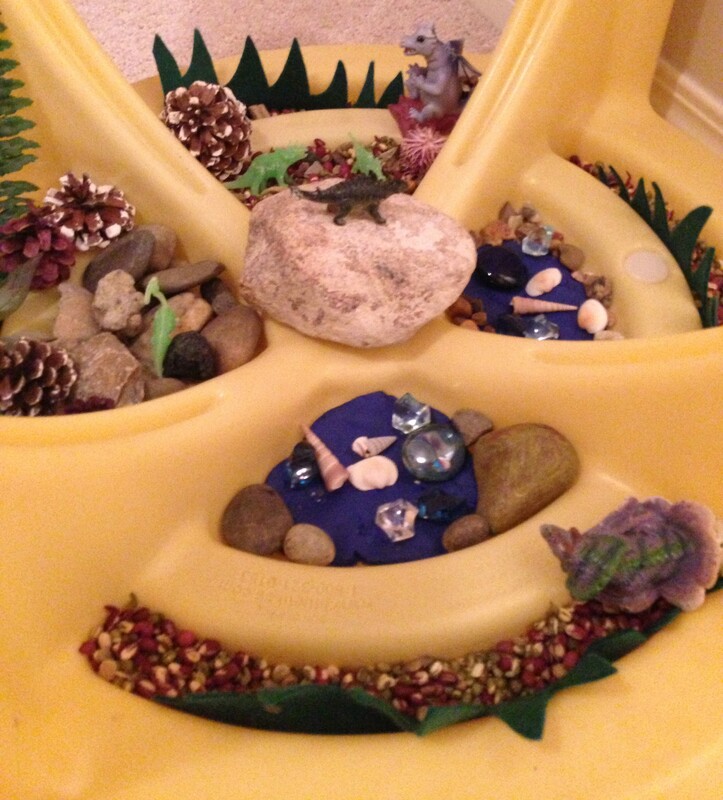 The first thing that you have to decide if you are going to make a mini world for sensory play or otherwise, is what you are going to create it in. You can use anything. Tupperware bins, lids, boxes, whatever you decide will work the best for what you are making. Just be sure that if you are making a water world that the container you use is leak free and waterproof. We decided to make a dinoland in order to curb my obsession with dinos and mini worlds combined. And we decided to make it in an upside down plastic table. Don’t ask. It was the only thing that we could find that seemed suitable at the time. I didn’t know if it would work out but it proved to be a huge hit. Here are some pics of the finished product. For plants we just dug up as many fake leaves and pinecones that we could find. We also cut some plants from green felt. We already had the rocks from my daughter’s plethora of rocks in her collection and we used some pretty glass marbles that we found in the junk box. For the watering hole, I just took some blue modelling clay and pressed it into shape. Then for sand we filled all the remaining crevices with dried beans. Yes, dried beans, a whole bag of them. I wasn’t cooking them anyway. I often forget to cook anything so that’s why some of my food products end up in my crafting projects. Anyway, there you have it. 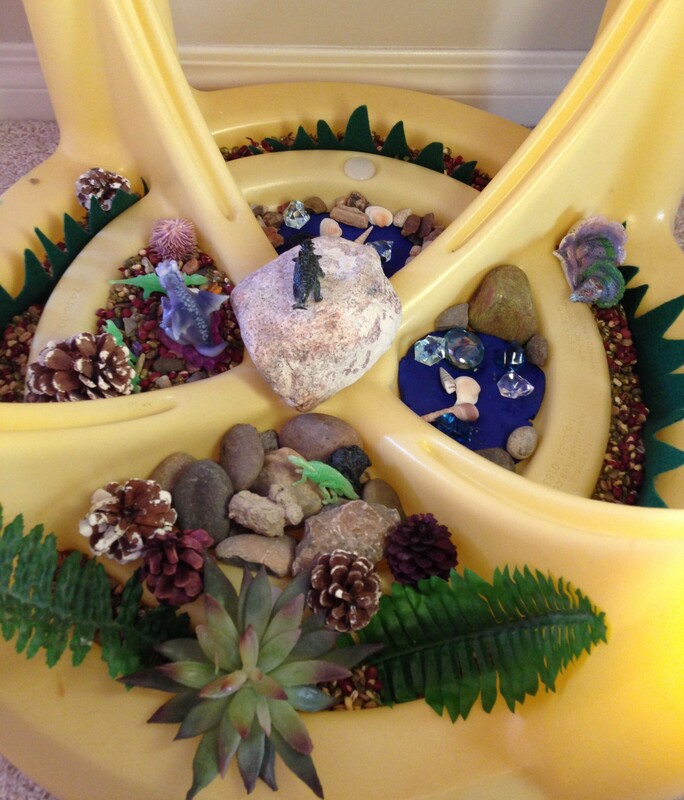 A perfect mini dinoworld that the kids can dig in and play dinos in all day long. We have since accumulated quite the collection of plastic dinos that have come to live in our dinoland and it is still going strong. Even the Tinkerbell fairies sometimes come to play in dinoworld too. Lots of fun! 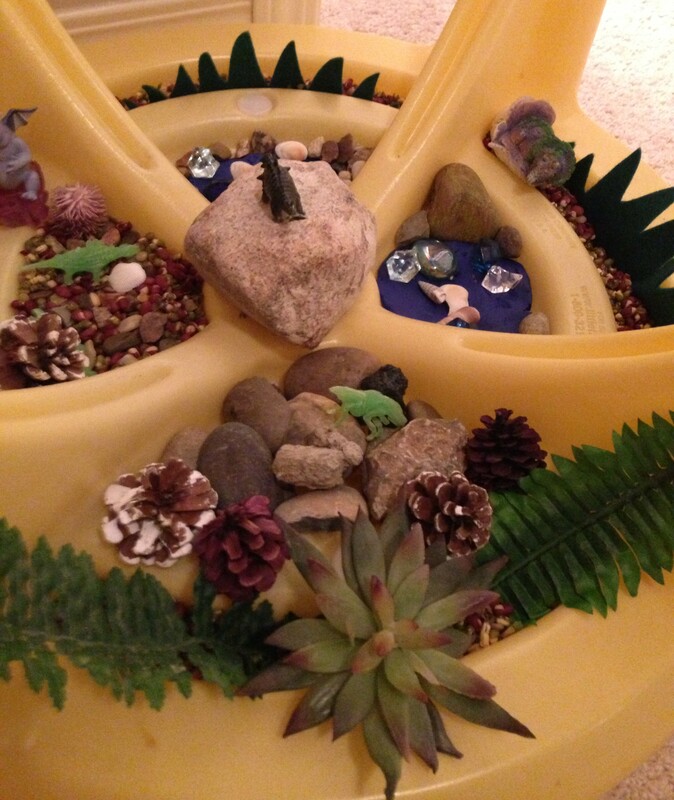 Have you ever made any mini worlds for sensory play? What materials did you use?